Enjoy a night of star gazing from the second story deck or sit in the rocking chairs out front sipping morning coffee while watching the wildlife. Outside under the big Elm tree. You will find a propane grill and picnic table. Located close to town but feels like the country. Most wine tours will be happy to pick you up at our front door. Come join us for a weekend getaway of rustic romance! FUN spot for a getaway! Lee White - Texas historical researcher and author who loves the history of this property. She is a direct descendant of the oldest man to die in the Alamo Gordon C. Jennings She lives in Fredericksburg with her husband and teenage daughter. Historic charm circa 1847-one of the oldest buildings in Fredericksburg. Built by the first Mormon Colony in Texas. 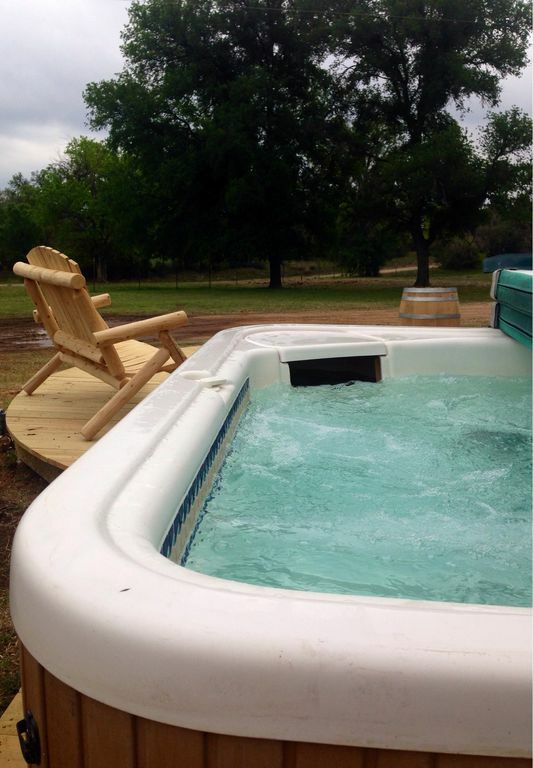 ROMANTIC HOT TUB Quiet country setting just a few minutes drive to downtown Fredericksburg shopping,dining and art galleries. Located in the midst of the 290 Wine Trail. It was a very BEAUTIFUL and clean home. The hot tub was a huge plus! I recommend any couple to stay at the Wild Ram! Enjoyed our stay! Loved the place, very nice and convenient to Fredericksburg, Luckenbach etc. We enjoyed the barn house. Everything was great! Very quiet location and just a few minutes to town. Enjoyed our stay while visiting family. Nice big shower and comfortable bed. Wonderful place to stay while visiting local wineries! We loved being here. It is charming and convenient. We love the rustic style and wide open spaces of the ranch area. We look forward to our next visit! Rustic with the comforts of home. Rustic charm, all the conveniences, and only a 4 minute drive from downtown Fredricksburg. If you are looking for fancy, then move on, but if you are looking for country and rustic, but with A/C, WiFi, hot tub, and even a washer/dryer; then this is perfect for two couples. 5 minutes to downtown-shopping,dining,galleries,live theater and music.